From time to time, I get a very specific idea in my head of the image I want to create. Today, I want to talk about one such experience. Unlike my previous Behind the Picture posting, this time I'll discuss in greater detail some of the settings I chose, some of the techniques I used, and some of the decisions I made. It's not the most original image I've ever taken (or the best). But it appeared quite clearly in my mind, and I set about creating it quite purposefully. I hope you find the discussion useful. I had passed by an interesting intersection in the middle of Bangkok early in the day. Below me, I saw snarling traffic careening around corners and under pedestrian walkways, as the skytrain roared above. 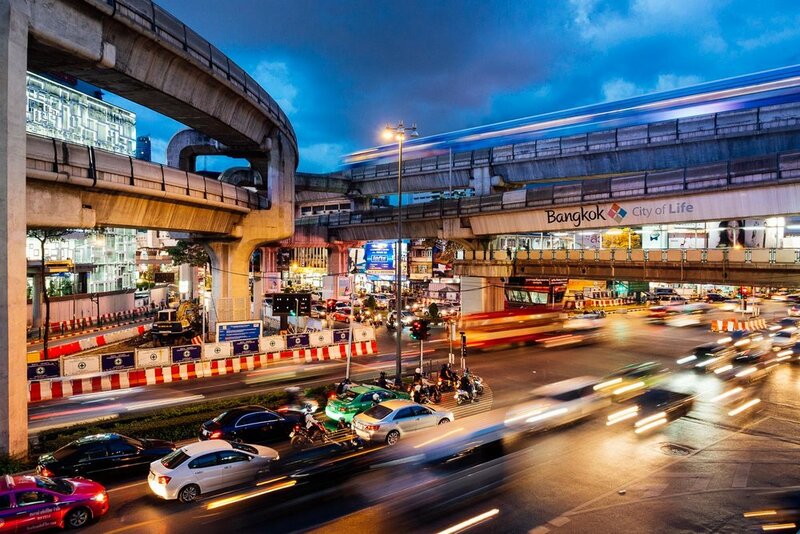 I noticed that the sign hanging calmly amidst the frantic rush said, "Bangkok: City of Life." A picture was born in my mind, and I wasn't going to let it go. I wanted to capture Bangkok's lively rush hour traffic, swirling around the quite appropriately worded sign. I imagined blurred cars speeding in both directions below the sign, lights flashing, and a dramatic sky above. I decided to come back to the intersection at about an hour before sunset. My first challenge was to find the best direction from which to capture the intersection. I imagined that shooting a bit at an angle would create a more dynamic perspective than positioning myself head-on. I walked up and down the pedestrian walkway across from the sign looking for the right spot. I picked a relatively wide-angle lens (24mm equivalent, a bit wider than a phone's camera), and positioned my lens so that I captured the roaring traffic crossing at a slight diagonal below, and the brooding clouds in the sky above. My main goal was to capture the traffic's movement and energy. That likely meant setting a slow (or long) shutter speed. This would allow me to blur the movement of the cars. I also wanted to make sure the whole image was in focus, from the cars, to the clouds, to the overpasses. A relatively narrow aperture would make sure everything in the scene was in focus. If the terms "shutter speed" and "aperture" mean nothing to you, you might be interested in learning more. I recently found a brief video that provides a clear, visual primer on what shutter speed, aperture, and ISO mean, and how to use them to take control of your photography. It goes a bit fast, but you can slow it down in YouTube's settings. A long shutter speed meant I would need a tripod to keep my camera still. I was traveling light, and had a Manfrotto Pixi EVO 2 with me, instead of a larger tripod. It's not a bad, but I actually prefer the original version, the Manfrotto Pixi (which is sturdier, if less versatile, but also cheaper). If you're interested in a small, portable, and practical way to steady your camera when you're traveling light, either will do the job quite nicely. I set my shutter speed to around four seconds, and took a few shots. Looking at my rear screen, I could tell that 4 seconds was a bit too slow of a shutter speed for what I had imagined. I wanted to blur the vehicles to show they were moving, but I didn't want full-blown light trails. Light trails are what you see below, when a car's lights blur into a solid line. I increased my shutter speed to about half a second, instead of a full four seconds. I found what I was looking for. At this speed, the vehicles were clearly distinguishable even when moving at medium speed, but blurred enough so as to suggest the movement and energy I wanted to capture. Additionally, I was just in time. The light was getting perfect, with the dark, shadowy, purple hue in the clouds contrasting nicely with the orange glow of the city lights. The next step was to capture just the right amount of cars in the road. I also (in one of my more obsessive moments) was determined to have one of the trains rushing above the sign as the cards sped below it. It took quite a few shots to get what I was looking for. Below are a few of the different results I ended up with. I ended up choosing the second image in the second line (the sixth image from the top). I felt like it had the best balance of traffic moving in both directions, color in the sky, blurred lights, and variety of vehicles in the road. I won't explain my thought process for every single image, but I can share some of my observations. In the first image, for instance, the sky was too light, and my timing was such that the light trails were still too pronounced. The final image, on the other hand, has a sky that is much too dark. The other shots in that final row are all bit too stationary, as the traffic was coming to a stop in each of those images. For these reasons, I picked image number six. The image I ended up picking not only had the right balance of movement and light, I actually managed to catch the train rushing by in the background. After picking my final image, I went to work post processing the image (something I'll perhaps go into in more detail in a future post). Using Adobe Photoshop Lightroom CC, I increased the contrast, made the colors a bit more vibrant, and sharpened the image slightly, among other things. I was pretty happy with the result. I encourage you, next time you go out, to try and envision an image in your mind, and capture that image as best you can in a photograph. It doesn't always work out. But purposefully overcoming obstacles, making decisions, and manipulating your camera's settings to get the result you want can be enormously edifying, and satisfying. Even when you fail, it makes for a good learning experience. All images shot with an Olympus OM-D E-M10 mark ii, and the Olympus M. Zuiko Digital ED 12mm f2.0 lens, or a Canon EOS 6D, and the Mitakon 35mm f2.0 lens.